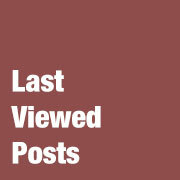 First thing you need to do is to install and activate the Last Viewed Posts plugin. After activating the plugin, go to Appearance » Widgets. Drag and drop Last Viewed Posts widget to your sidebar and it will immediately start showing posts a user last viewed. Any new plugins to show recently viewed post in a carousel format?. Is this plugin still maintained? I’m looking for this exact functionality. Thanks! Is there a way to do this to have it highlighted next to the post title rather than in a widget? This is a fantastic little gem. Is there a way to make this display other (custom) post types, or history across a multisite network? Is there a way to show the whole post (i.e. get_post) instead of just the title? Would you be able to provide the code and the location or where to place it in the plugin code? Thanks! I have installed the plugin but have trouble installing the widget. Go to Appearance > Widgets > Click on Last Viewed Posts> Click Primary Sidebar>Add Widget, nothing happens. If I drag and drop the Last Viewed Posts still nothing happens. Is there a shortcode for this plug in? I would like to insert this within a post. No currently it does not have a shortcode. However, you can try our tutorial on how to add WordPress widgets in posts or page content. This works nicely on my localhost but throws a “Cannot modify header information – headers already sent” error on the production server. Seems like content has already begun to output when you set the cookie. I’m using Roots theme and WordPress 3.6. Any suggestions on how to solve this? Yes, but you would have to edit the plugin file. Thank you for this lovely little plug-in. It greatly adds to the personalization experience on a site. Is the plugin on github? I’d love to contribute. Wouldn’t it be better to use some kind of override in your own theme or plugin to change the value of those variables? If you edit the plugin directly, when you update the plugin(which you should always do!) you’ll lose those changes. It shouldn’t be too hard to hook in right after the plugin is activated and assign new values to what I’m assuming are global variables.